Copyright © 2006 by Thieme Medical Publishers, Inc., 333 Seventh Avenue, New York, NY 10001, USA. 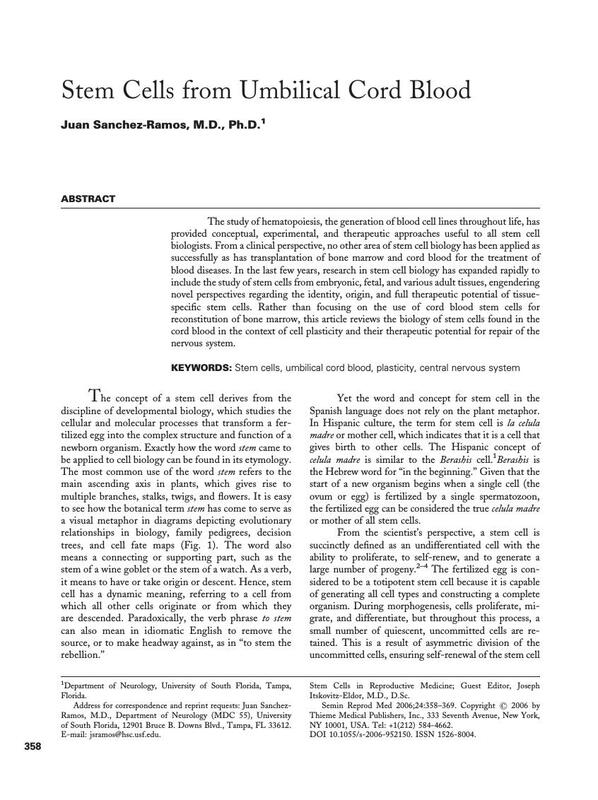 The study of hematopoiesis, the generation of blood cell lines throughout life, has provided conceptual, experimental, and therapeutic approaches useful to all stem cell biologists. From a clinical perspective, no other area of stem cell biology has been applied as successfully as has transplantation of bone marrow and cord blood for the treatment of blood diseases. In the last few years, research in stem cell biology has expanded rapidly to include the study of stem cells from embryonic, fetal, and various adult tissues, engendering novel perspectives regarding the identity, origin, and full therapeutic potential of tissue-specific stem cells. Rather than focusing on the use of cord blood stem cells for reconstitution of bone marrow, this article reviews the biology of stem cells found in the cord blood in the context of cell plasticity and their therapeutic potential for repair of the nervous system.